Chilling injury occurs when temperatures are above 32°F and below 55°F. The plant tissue becomes weakened that leads to cellular dysfunction. The most noticeable visual symptom of chilling injury is leaf and hypocotyl wilt (Figure 1). This is caused by the rapid decline in the ability of roots to absorb and transport water. It also caused by the plant’s reduced ability to close stomata. If temperatures do not improve, plants may be killed. Low temperatures also have an effect on mineral nutrient uptake of the plants. Absorption of ions by roots is difficult, as well as their movement in the above-ground parts of the plants. As a result, chilling injured plants often show symptoms similar to nutritional deficiency. Figure 1. A cucumber plant wilt after transplanting. Although warm-season vegetables are all susceptible to frost/freezing damage, their susceptibility to chilling injury varies among plant species. Pepper plants seem to have greater difficulty recovering after chilling injury compared to tomato plants. 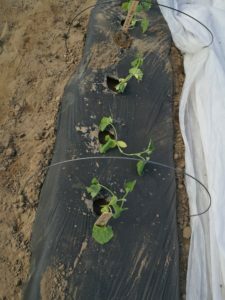 Cucumber plants are more susceptible than watermelon plants, and both cucurbit plants are more susceptible than tomatoes. Within the same plant species, different cultivars, plant growth stages, and the environment that transplants were grown in prior to exposing to cold affect cold tolerance. The approaches discussed in the previous article for helping plants from low-temperature damage is applicable here. In addition, this article will discuss a few more ideas. Although tolerance to low temperatures may not be the most important criteria in cultivar selection, cold tolerance should be considered, especially for early planted fields. Recently, we evaluated cold tolerance of 19 commercial cucumber cultivars (including field grown slicer, pickle and greenhouse and high tunnel grown cultivars) and found great differences in cold tolerance among them. 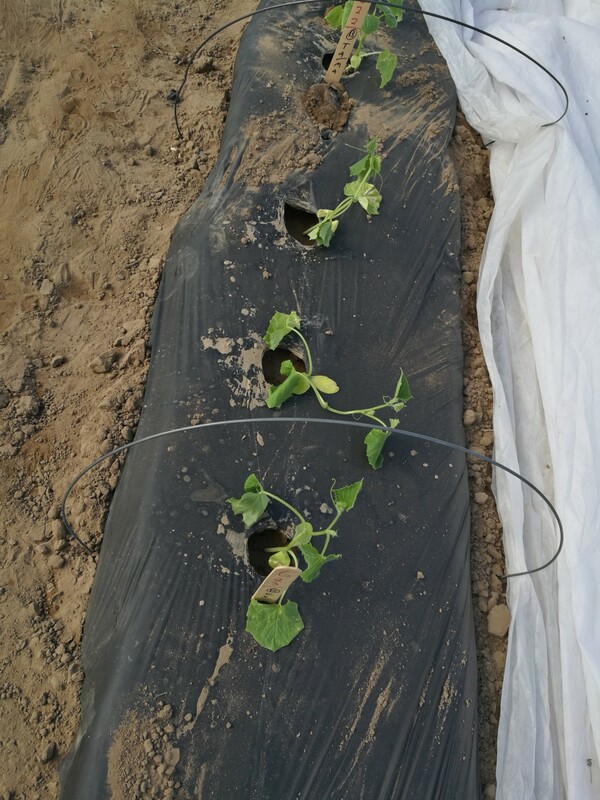 These cucumber seedlings were placed outside of the greenhouse for a night when temperature gradually dropped from 60°F to 30°F. They were brought back to greenhouse the next morning. We then compared leaf areas of the cucumbers. Most cultivars, except a field grown pickle, had a leaf area smaller than the day before, indicating those plants were more or less wilted after the chilling stress. After the plants were placed in the greenhouse for 24 hours, about 1/3 of cultivars recovered and started to grow. Interestingly, we found that English cucumbers that are bred for greenhouse production tend to be more susceptible to chilling injury than some of the field grown cucumber cultivars. It was documented that varietal difference existed in chilling-susceptible vegetables, such as cucumber and watermelon. Unfortunately, this information is not readily available for farmers from seed companies. Farmers have to depend on their experience in selecting cold tolerant cultivars. Research in this area is surely needed. Studies have been conducted in using trace elements, synthetic growth regulators, and antioxidants to increase cold tolerance of chilling-sensitive plants. Their mechanisms might be to increase fluidity of members; alter activity of membrane enzymes; and influence hormone synthesis. Availalbe products that can be used on vegetable seedlings such as Soil Triggrr® (active ingredient: cytokinin), LandSpringTM WP® (active ingredient: 1-Methylcyclopropene). LandSpringTM WP® was registered to spray on transplants a few days before transplanting, and Soil Triggrr® can be applied at transplant, preplant and early plant growth stages. Their labels can be found at https://assets.greenbook.net/L107175.pdf and https://agrofresh.octochemstore.com/wp-content/uploads/2017/04/LandSpring-_epa-approved-seedling-label.pdf. Results of the effects of using these products may not consistent, primarily because their effects are greatly influenced by environmental factors and plant species. We have tested LandSpringTM WP® on processing tomato two years ago at the Southwest Purdue Agricultural Center, and observed a positive effect of using this product to improve early plant growth.